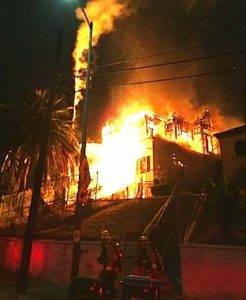 A fire that broke out inside a large 1890’s Victorian home near Mariachi Plaza in Boyle Heights, collapsing most of the building and spreading to a nearby apartment building Sunday night before it was finally extinguished, may have been housing transients, according to the Los Angeles Fire Department. The fire inside the two-story Victorian home at 1516 E. Pleasant Ave. was reported at 7:57 p.m., fire department spokeswoman Margaret Stewart said. When firefighters arrived, they found the two-story, wooden-sided structure completely engulfed, according to the department, which said additional resources were called and the status raised to that of Greater Alarm. The flames partially collapsed the home on its southwest side, Stewart said, and into an adjacent apartment building. Firefighters on Sunday responding to the call found the two-story Victorian style home completely engulfed in flames. The blaze then spread to the attic of a next door apartment building and firefighters had to take down part of the apartment building’s ceiling to knockdown those flames. LAFD dispatched 101 firefighters to the scene and needed about an hour to extinguish the flames, Stewart said. The LAFD credited the quick action of firefighters in pulling ceiling and getting handlines in place for preventing the fire from running the building. Four units on the second floor had to be evacuated, but no injuries were reported. Arson investigators were sent to the scene to determine what caused the fire, which remains under investigation, Stewart said. The Red Cross was at the scene to arrange housing for those displaced from the apartment building, she said. The 3,443 square-foot Victorian is reported to be the site of a previous burn and possibly home to transients, LAFD said in a news release. Once a single-family home, it was later converted to a 9-room hotel, according to the Boyle Heights Beat and a 2006 listing on the real estate website LoopNet. 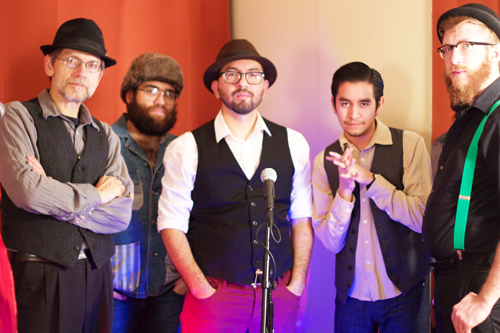 For a time it housed local musicians and was dubbed the Mariachi Hotel, according to the Boyle Heights Beat. Given the size of the building and the continuing collapse as it settled, firefighters remained on scene to address flare ups through the night, said the LAFD. Boyle Heights resident Leticia Andrade last Saturday said she would like to see affordable housing built on an empty lot located behind Mariachi Plaza. Restaurant owner Armando Salazar wants a grocery store or a public parking lot, and senior Carmen Fuentes thinks a center offering services to seniors and children would be a good fit at that location. Andrade told EGP she knows of families that have “up to seven people living in a one bedroom apartment” and building more affordable housing would help alleviate some of the overcrowding. Hers and other views were expressed during the first of two public workshops being hosted by Metro to gather input from Boyle Heights residents and stakeholders on what the transportation agency should do with two empty lots it owns adjacent to Mariachi Plaza, on Bailey Street between Pennsylvania and 1st Streets. The design workshops are being facilitated by Metro’s urban design/architectural consultant team, with the objective of creating a project that will reflect “community goals” for the space. Mariachi Plaza is an iconic place for Boyle Heights, Metro Director of Planning Vivian Rescalvo told EGP, explaining that Metro wants to hear directly from the community how they would like see the space used, whether it’s for housing, public space, retail or any other ideas. This is not the first time Metro has traveled down this road. Past proposals for developing the lots were met with strong community opposition ultimately scrapped. Metro is starting all over with new ideas and community input, Rescalvo said. 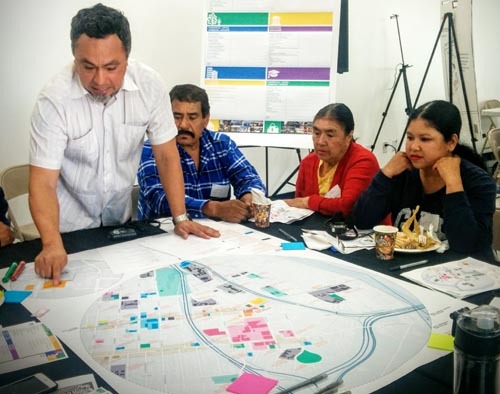 “We are ready to hear from the community based on what Boyle Heights has, what do they feel it needs and what do they think is the right use for these properties immediately adjacent to Mariachi Plaza,” she said. 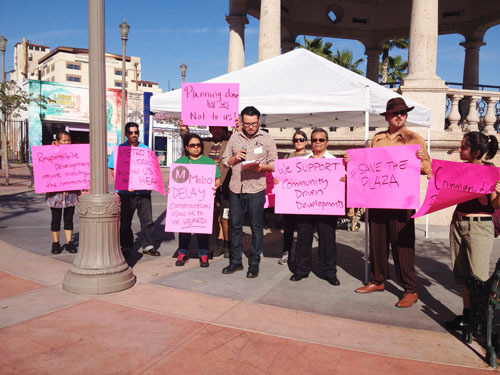 Salazar owns the Santa Cecilia Restaurant at Mariachi Plaza and thinks the community needs a grocery store. “We used to have a market and it was demolished when Metro started building,” he told EGP. 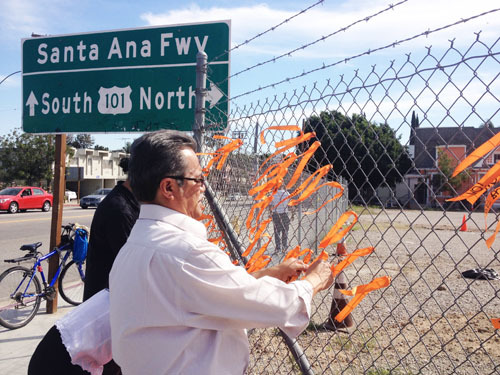 “A parking lot for Boyle Heights visitors would also be a good idea,” he added. A photo of a large group of people gathered on a sidewalk on Cesar E. Chavez Avenue, showcased the need for more open spaces with benches; a photo of a graffiti covered wall called attention to the need for more recreational areas to prevent tagging of existing murals; and a photo of street vendors on a local sidewalk suggested the empty lots could be used as a place for street vendors to sell their wares. Las Fotos Project member Jennifer Bermudez said her photo of cars parked on the street shows there is a need for more public parking. 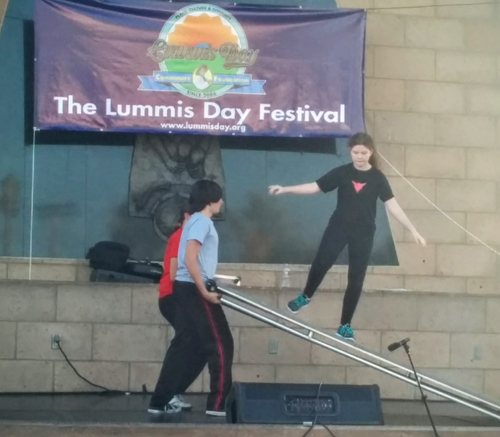 “We live in a dense area, and especially in Mariachi Plaza and Cesar Chavez where a lot of events are going on, there’s no parking,” she said. “That’s always a struggle [to find parking] and that creates [more] traffic,” Bermudez said. The workshop included opportunities for the 100 or so people in attendance to meet in small groups with Metro planning representatives to discuss the ideas for the land they believe to be the best fit for the eastside neighborhood —whether taken from the photos they had just seen or based on what they see in their everyday life. “A pool,” suggested one resident. “A skate park,” said another. Rafael Chagoya is a member of the Boyle Heights Neighborhood Council and he thinks public restrooms at Metro’s Gold Line station at Mariachi Plaza is what’s needed. Many other Metro stations have public restrooms, but there are none here, he told the group at his table. Chagoya also supports creating a space where street vendors can do business in a “dignified way,” without being kicked out every time they try to sell their goods. Andrade agrees. If new affordable housing makes it into Metro’s plan, she suggests the housing include street level retail space, which could be a good rental option for local street vendors. At the end of the workshop, participants were given green stickers to vote for their four favorite ideas presented and red stickers for the two options they most opposed. Among the top options were a grocery store, parks, affordable housing or public parking. Getting the highest number of no votes were proposals for commercial use, such as offices, a healthcare clinic, bank or gym, and for civic spaces like a library or city/county/state agency. A second community workshop will take place March 9 at Bishop Mora Salesian High School from 6:30 to 8:30pm. Residents and stakeholders are encouraged to attend. For more information, visit, https://www.metro.net/projects/jd-boyle-heights/upcoming-meetings/. La residente de Boyle Heights Leticia Andrade dijo el sábado que le gustaría ver un edificio de vivienda asequible construido en un terreno baldío ubicado detrás de la Plaza del Mariachi. Armando Salazar dueño de un restaurante quiere un supermercado o un estacionamiento público, y la señora Carmen Fuentes cree que un centro que ofrezca servicios para las personas mayores y niños sería un buen uso de ese lugar. Andrade le dijo a EGP que ella conoce a familias que tienen “hasta siete personas viviendo en un apartamento de una recamara” y la construcción de más vivienda asequible ayudaría a aliviar un poco la sobrepoblación. Su punto de vista junto al de otras personas fueron expresados durante el primero de dos talleres públicos que están organizados por Metro para obtener opiniones de los residentes de Boyle Heights y otros interesados sobre lo que la agencia de transporte debe hacer con los dos lotes vacíos que posee junto a Plaza del Mariachi, sobre la calle Bailey, entre las calles Pensilvania y Primera. Los talleres de diseño están siendo facilitados por el equipo de consultores urbanistas y arquitectos de Metro con el objetivo de crear un proyecto que refleje “los objetivos de la comunidad” para llenar el espacio. 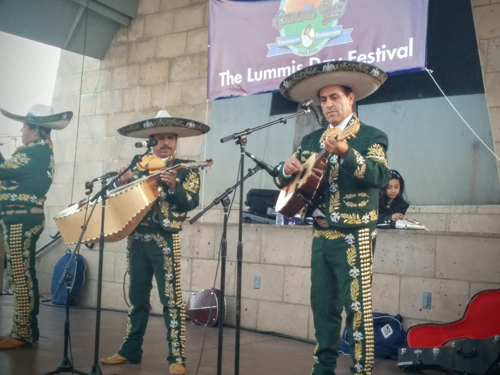 La Plaza del Mariachi es un lugar emblemático en Boyle Heights, dijo a EGP Vivian Rescalvo, directora de planificación con Metro. Explicó que Metro quiere escuchar directamente de la comunidad cómo les gustaría ver el espacio utilizado, ya sea para vivienda, espacio público, negocios al por menor o cualquier otra idea. Esta no es la primera vez que Metro ha viajado por este camino. Propuestas anteriores para el desarrollo de los lotes se encontraron con una fuerte oposición de la comunidad que terminaron finalmente siendo desechadas. Metro está empezando de nuevo con nuevas ideas y sugerencias de la comunidad, dijo Rescalvo. “Estamos dispuestos a escuchar a la comunidad basado en lo que Boyle Heights tiene, qué es lo que sienten que necesitan y qué es lo que piensan que es el uso correcto de estas propiedades inmediatamente adyacentes a la Plaza del Mariachi”, dijo. Salazar es dueño del restaurante Santa Cecilia en la Plaza del Mariachi y piensa que la comunidad necesita un supermercado. “Antes teníamos un mercado y fue demolido cuando Metro comenzó la construcción”, le dijo a EGP. “Un estacionamiento para visitantes de Boyle Heights también sería una buena idea”, agregó. Una foto de un grupo de personas reunidos en una acera de la avenida César E. Chávez, mostró la necesidad de más espacios abiertos con bancas; una foto de una pared cubierta de graffiti llama la atención acerca de la necesidad de áreas recreativas más para prevenir el graffiti en los murales existentes; y una foto de los vendedores ambulantes en una acera local sugirió que los lotes vacíos podrían ser utilizados como un lugar para que los vendedores ambulantes puedan vender su mercancía. Jennifer Bermudez, miembro de Las Fotos Project dijo que su foto de vehículos estacionados en la calle muestra que hay una necesidad de más estacionamiento público. “Vivimos en una zona densa, y especialmente en la Plaza del Mariachi y Cesar Chávez donde ocurren muchos eventos, no hay estacionamiento”, dijo. “Eso es siempre una lucha [para encontrar estacionamiento] y crea [más] tráfico”, dijo Bermúdez. El taller incluyó oportunidades para que las mas o menos 100 personas que asistieron se reunieran en pequeños grupos con representantes de planificación de Metro para discutir las ideas que ellos creen sería la mejor opción para el terreno en el barrio del lado Este—ya fuera tomando ideas de las fotos que acababan de ver o basándose en lo que ven en su vida diaria. 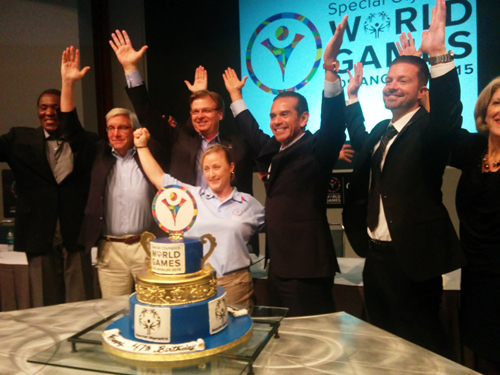 Se les animó a “soñar en grande”. “Una piscina”, sugirió una residente. “Un parque de patinetas”, dijo otro. Rafael Chagoya es miembro de la Junta Vecinal de Boyle Heights y piensa que se necesitan baños públicos en la estación de la Línea Dorada de Metro en la Plaza del Mariachi. Muchas otras estaciones de Metro tienen baños públicos, pero no hay ninguno aquí, le dijo al grupo en su mesa. Chagoya también apoya la creación de un espacio donde los vendedores ambulantes puedan hacer negocios de una manera “digna”, sin ser expulsados cada vez que tratan de vender sus productos. Andrade está de acuerdo. Si la nueva vivienda asequible se aprueba en el plan de Metro, ella sugiere que la localidad incluya espacios de ventas al pormenor en el primer piso, lo que podría ser una buena opción de alquiler para los vendedores ambulantes locales. Al final del taller, los participantes recibieron stickers verdes para votar por sus cuatro ideas favoritas presentadas y stickers rojos para las dos opciones que menos deseen ver en esa localidad. Entre las principales opciones estuvieron un supermercado, un parque, vivienda asequible o un estacionamiento público. El mayor número de votos con stickers rojos o no votos en general fueron para el uso comercial, tales como oficinas, una clínica de atención médica, banco o un gimnasio, ni para espacios cívicos como una biblioteca o agencia de la ciudad/condado/estado. Un segundo taller de la comunidad se llevará a cabo el 9 de marzo en la escuela preparatoria Bishop Mora Salesian de las 6:30 a 8:30pm. Residentes e interesados están invitados a asistir. 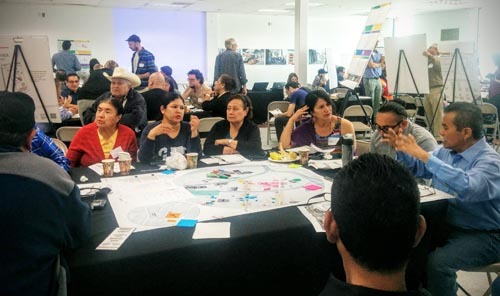 Para obtener más información, visite, https://www.metro.net/projects/jd-boyle-heights/upcoming-meetings/. A man who was arrested for allegedly trying to rob an 84-year-old woman near Mariachi Plaza in Boyle Heights was expected to appear in court yesterday, authorities said. Gregory Dudley, 24, was arrested on June 3 and booked on suspicion of attempted robbery in connection with the crime, which occurred as the woman was walking south on Boyle Avenue toward East First Street on April 28 around 1:50 p.m., the Los Angeles Police Department reported. Dudley was being held in lieu of $80,000 bail and was expected to appear in court in downtown Los Angeles, according to police and the sheriff’s department. On April 28, a suspect pushed the woman against a wrought iron fence after she was able to prevent him from stealing her purse. Then he fled. Police said the suspect was seen running into a Metro station, and authorities released surveillance video of his image boarding a westbound train. The victim suffered a broken nose and severe bruises to her face and right knee as a result of the assault. Ricardo Ávalos, 41, de Los Ángeles fue sentenciado el martes a tres años en prisión por la muerte de José Noriega de 101 años. El 1 de octubre de 2014 Ávalos manejaba una van que golpeó a Noriega mientras cruzaba la calle Lorena en un cruce peatonal marcado a las 6am. Ávalos huyó, pero testigos lo persiguieron—con uno cerrándole el paso y otro agarrando las llaves. Noriega fue trasladado al Hospital del Condado, donde fue declarado muertos. Ávalos fue condenado inmediatamente después de entrar en una súplica de “no contestación” por un cargo de delito grave de conducir y huir de la escena con resultado de muerte y un cargo de delito menor de homicidio vehicular. Gabriel Vargas Jr. 19, estaba con otras personas en un patio en 563 Via Altamira cerca del mediodía del viernes cuando un agresor no identificado se acercó y lo asesinó. El sospechoso comenzó una discusión, sacó un arma y le disparó varias veces a Vargas y huyó en dirección desconocida. Vargas fue declarado muerto en la escena. Los investigadores no creen que Vargas era un objetivo aleatorio, de acuerdo con un teniente de la policía de Montebello. No se han descartado motivos, incluyendo la posibilidad de que el tiroteo estuviera relacionado con pandillas, dijo. La policía de Montebello pide a cualquier persona que sepa de este asesinato llame al detective Paul Antista al (323) 887-1249. Gregory Dudley, 24, quien fue arrestado por presuntamente intentar robar una mujer de 84 años, cerca de Plaza del Mariachi se presentó en la corte del centro de Los Ángeles el miércoles, según autoridades. Estaba bajo fianza de $80,000. Dudley fue detenido el 3 de junio por sospecha de intento de robo contra la mujer que caminaba por la Avenida Boyle hacia la Calle Primera el 28 de abril alrededor de 1:50pm, informó el Departamento de Policía de Los Ángeles. El sospechoso empujó a la mujer contra una valla de hierro forjado después de que ella fue capaz de evitar que el robo de su bolso. Luego huyó. La policía dijo que el sospechoso fue visto corriendo en una estación de metro, y autoridades mostraron video de vigilancia de su imagen al subirse a un tren con rumbo al oeste. La víctima sufrió una fractura en la nariz y contusiones graves a la cara y rodilla derecha como consecuencia del asalto. Un grupo de activistas comunitarios quieren que Metro detenga o retrace la construcción de un desarrollo mixto de viviendas asequibles planeadas en el área de la Plaza del Mariachi en Boyle Heights. El viernes por la tarde llevaron su protesta hasta la esquina de las calles Primera y Boyle donde un grupo pequeño de residentes, estudiantes y activistas a favor de la vivienda asequible amarraron alrededor de 600 listones en la malla de alambre que rodea el lote vacío—creando las palabras “Save BH” (Salven a Boyle Heights)— lugar conocido por locales como Plaza del Mariachi Oeste donde se desarrollará el proyecto. En cada uno de los listones estaba escrito un comentario de algún residente o partidario indicando qué es lo que les gustaría ver construido en el lote, y ahí se pedía desde más espacio verde abierto, una cancha de fútbol o un estacionamiento público. Esta es la segunda vez en los últimos meses que grupos protestan planes de desarrollo de Metro en propiedades cerca de la estación de la Línea Amarilla de Metro en la Plaza del Mariachi. La manifestación del viernes fue organizada por la Coalición para Salvar Mariachi Plaza y estudiantes de la escuela charter CALO YouthBuild en Boyle Heights. Ellos dicen que Metro y el desarrollador del proyecto McCormack Baron Salazar no involucraron a la comunidad en el proceso de planificación y quieren que haya más comunicación con la comunidad antes que comience la construcción de los Apartamentos Santa Cecilia. “Hay mucha preocupación porque estos grandes proyectos llegan y la comunidad en realidad no tiene voz sobre qué o cómo se deberían ver”, Mynor Godoy, Presidente del Comité de Planificación y Uso de Tierra del Consejo Vecinal de Boyle Heights le dijo a EGP. Metro aprobó el proyecto de vivienda en el 2009, pero estuvo detenido debido a problemas financieros, según el portavoz de Metro de Dave Sotero. Estos problemas ya han sido resueltos, dijo el martes. Cuando se construya, el desarrollo de Santa Cecilia Apartments LLC incluirá 80 unidades de vivienda asequible y 4.000 pies cuadrados de espacio comercial en el primer piso. Sotero le dijo a EGP que el proyecto sería 100 por ciento de vivienda asequibles, y señaló que Metro es uno de los mayores proveedores de viviendas económicas en el condado de Los Ángeles. “La agencia tiene más de 1.700 unidades de vivienda asequible completados, en construcción o en negociación en sus proyectos de desarrollo a nivel condado”, dijo Sotero. Sin embargo, la coalición se pregunta que es lo que Metro y los urbanistas consideran “asequible”. Algunas personas mayores y algunos jóvenes no podrán cumplir con el requisito de bajos ingresos para calificar, dijo el residente de Boyle Heights Baldomero Capiz. Los propietarios de varios negocios locales dijeron que están preocupados por el nuevo proyecto que hará más complicado el estacionamiento en el área. Erika Gómez es dueña del restaurante Yeya’s, situado al cruzar la calle de la Plaza del Mariachi. Ella le dijo a EGP que la mayor preocupación para los negocios de la calle Primera es la grave escasez de estacionamiento. “Sólo tenemos dos espacios de estacionamiento [de frente] a la calle; uno es de 20 minutos y el otro es [sólo] para descargar”, dijo. Ella piensa que el vecindario estaría mejor si el lote se convirtiera en una estructura pública de estacionamiento. Sin embargo, Vivian Rescalvo, directora de Planificación y Desarrollo del Condado con Metro, le dijo a EGP que los planes para el proyecto se han finalizado y la construcción de los Apartamentos Santa Cecilia en 1750 E. 1st Street comenzará a finales de marzo y tomará unos 16 meses para completarse. La protesta del viernes pasado viene de la mano con los foros públicos donde la ‘gentrificación’ y la necesidad de más viviendas asequibles en la zona han sido el punto de atención. Rescalvo dijo que el complejo habitacional se enfocará en familias que ganan del 30-60% del ingreso medio en Los Ángeles. Por ejemplo, dijo, una familia de cuatro con un ingreso de $16,000-$24,000 pagará alrededor de $550 de renta al mes por un apartamento de dos recamaras. Una familia de cuatro que ganan entre $33,000-$48,000 pagarán alrededor de $1,100 por el mismo apartamento, explicó. Las solicitudes de los nuevos apartamentos no estarán disponibles hasta que “el edificio este listo o casi listo”, dijo. Sotero dijo que los urbanistas tomaron en consideración el problema de estacionamiento y han incluido 88 estacionamientos en el desarrollo habitacional y siete para el espacio comercial. Robert Zardeneta, director del CALO YouthBuild y miembro de la coalición, dijo el viernes que su objetivo es no oponerse a este proyecto específico “porque los miembros de la comunidad tienen sentimientos encontrados acerca de la propuesta”, pero esperan retrasar el comienzo hasta que haya participación de la comunidad con Metro y el desarrollador. Ya han pasado varios años desde que se aprobó el desarrollo de la vivienda y “muchos de nosotros no teníamos idea de que este proyecto ya estaba listo para su construcción”, dijo. La gente necesita saber que habrá durante y después de la construcción”. Mientras que la parte de vivienda del desarrollo no se pueden cambiar, el desarrollador McCormack ha acordado entablar reuniones públicas para obtener la opinión de la comunidad en cuanto a los tipos de negocios que les gustaría que ocuparan los espacios comerciales, según Rescalvo. Las reuniones se hacen debido al “nuevo proceso para involucrar a la comunidad” antes de comenzar una construcción de desarrollo de Metro, dijo. La oficina del Concejal José Huizar participará en las reuniones públicas, que deben tener lugar en una o dos semanas, según dijo a EGP el portavoz de Huizar, Rick Coca. Él dijo que Huizar apoya el proyecto Santa Cecilia ya que el 100 por ciento de las unidades de vivienda serán asequibles “y el concejal es un campeón en este asunto”. Coca agregó que el desarrollo propuesto por Metro para la Plaza del Mariachi Este estuvo “mal manejado por la agencia de Metro” y “eso no es lo que la comunidad quería”. En ese caso, frente a una fuerte oposición de la comunidad, Metro acordó detener el desarrollo Plaza del Mariachi Este y llevar a cabo reuniones públicas en los próximos seis meses para obtener aportes de la comunidad. Godoy dijo que Metro no sólo puede tener comunicación con los urbanistas e ignorar la comunidad. “Si ellos están dispuestos a decir que están empezando desde cero en la Plaza del Mariachi Este, deberían hacer lo mismo aquí”, finalizó.